For a great Sunday afternoon, or any afternoon really, we recommend a short stop at Christina’s at the lovely Van Loveren wine estate in Robertson. Pizza’s are of the adventurous kind with a thin crust and the burgers are loaded with great options like bacon or blue cheese. Of course the wine is quite quaffable and extremely well priced which means that there are worse ways to spend a lazy afternoon than this. 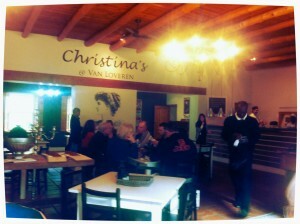 Speak to us about directions to get to Christinas at Van Loveren from Augusta. From Swellendam, it is a most picturesque short drive through Bonnievale, past our favorite local sparkling wine producer at Welgelegen (who also have a rather delightful restaurant on site). Tip at Christina’s: Man Salad looks amazing, Couscous salad excellent and the burgers are good value for money.